In October we opened a new Monogram Design Center at Specialty Appliance in Denver, Colorado. We interviewed Christina Dragota, Monogram Lead Product Specialist, to learn a little more about our new showroom. SRFD: Tell us about the space. Christina: It’s like a mini version of our Monogram Design Center in Chicago. People love that space because it not only helps them visualize what their kitchen could look like, but more importantly, what their home could feel like. 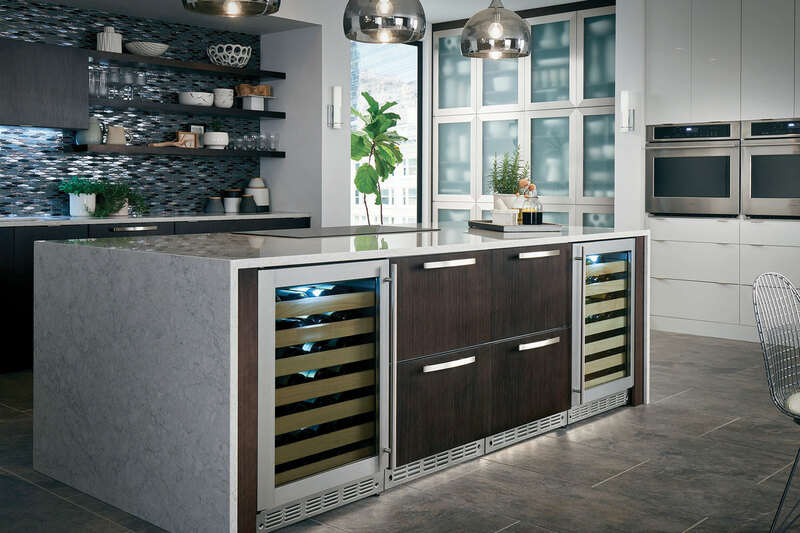 We wanted to emulate that feeling, but on a more local level, so we decided to partner with Specialty Appliance and create a space that incorporates an innovative yet beautiful design. Christina: It’s a great city that includes such a diverse manner of living where you can choose to be in a loft downtown, a cabin in the mountains, or both! The real estate business is thriving in Denver, so much so, that in this last year, home builders have increased production by 22 percent just to try to keep up with the incoming population. We wanted to tap into this growing market to really showcase what the Monogram brand is about and build a showroom where people can gather inspiration while learning about our products. SRFD: What’s something there that is unique? Christina: We have the first ever indoor, electric Pizza Oven, that requires no venting, NOW installed in a flush application (we don’t even have this in our Chicago location yet). No one has this technology available, let alone installed in this style, which is why we wanted to showcase it live. This allows people to come in our space to see, feel and use this exciting product. Seeing is believing- and we wanted people to take part in that experience. SRFD: What else will be available in this space? Christina: We offer cooking demonstrations with our on-site Chef and Design Center Manager so that customers are able to get an overall understanding of whichever products their interested in. When dealing with appliance technology, it’s important that the customer feels confident using it. Whether it’s using an induction cook top for the first time or wanting to perfect your Sous-Vide skills; we offer different types of demonstrations tailored to our customers’ interests. This way, they feel comfortable asking our Chef questions while enjoying meals prepared on our products.